The EU-Ukraine summit will be held that day. 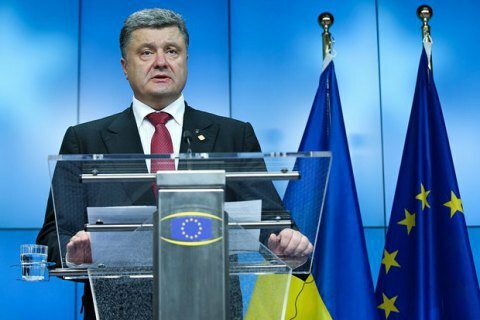 President Petro Poroshenko is confident that the European Parliament will ratify the agreement on visa-free travel for Ukrainians by 24 November. He was speaking in an interview with Ukrainian TV channels shown late on 23 October. "I am convinced that the European Parliament will sign and ratify the documents granting Ukraine the visa-free regime in full. I can even say by when [it is going to happen]. This will happen by 24 November. Why? Because the EU-Ukraine summit will be held on 24 November, and we agreed that the documents would have been ready by that day," he said. He stressed that Ukraine enjoys the support of the European Parliament's largest faction (European People's Party) and its President Martin Schulz, who represents the second largest faction, the Socialists. "We have the overwhelming, that is absolute majority in the European Parliament with regard to the ratification of the visa-free agreement," he said. He explained that the only reason for the delay in granting Ukraine visa-free travel was a mechanism for the suspension of visa-free travel which the EU decided to introduce due to the situation in the Middle East. "I really hope that we will reach understanding and that next week the suspension will be put to vote, a compromise will be found and Ukraine will have the decision on visa-free travel by 24 November. I wish Russian citizens the same if they implement democratic standards," he said.